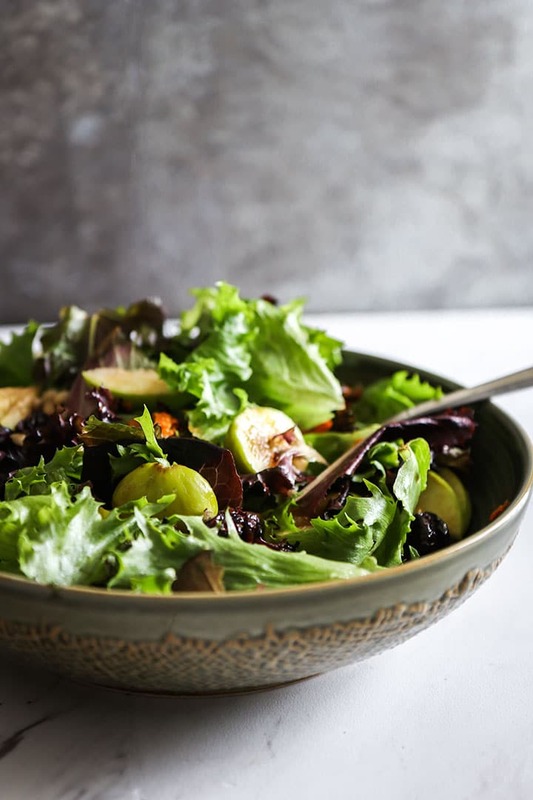 Apple Fig Barley Bowl, the perfect “almost autumn” plant-based salad of barley, mixed greens, sliced apples, dried cranberries and a light cashew dressing. I love this time of year – it’s not quite fall, but summer is fading. 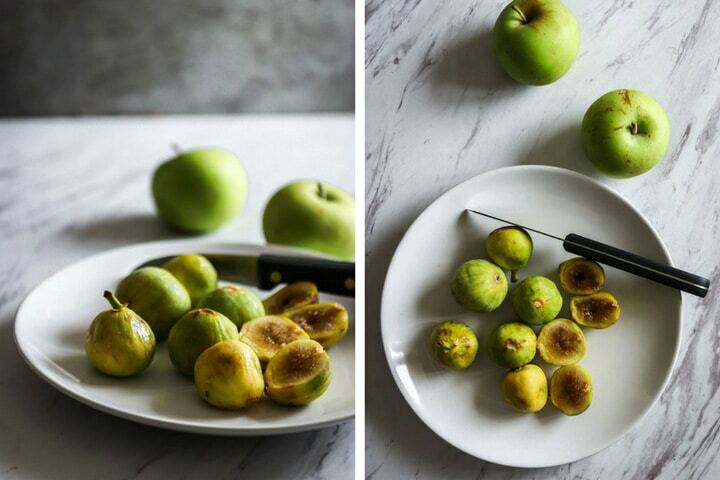 The squash and gourds start to make an appearance in the markets, but you can still find late summer figs and berries. It’s cooling off, but still warm enough to go without a jacket and you know the best of fall weather is still ahead. 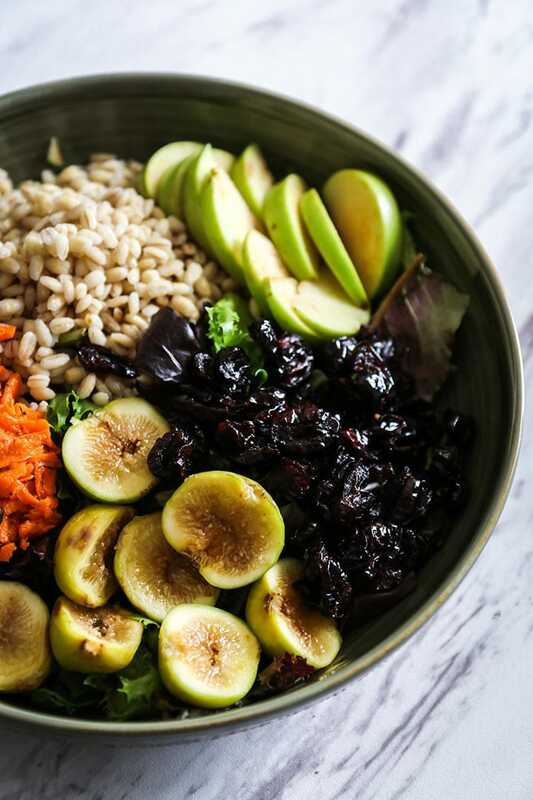 And cooler weather calls for heartier foods, and this Apple Fig Barley Bowl is the perfect almost salad/almost bowl for this “almost autumn” time of year. To say grain bowls are a “thing” right now would be an understatement. And while I’m a fan of the quinoa and cous cous standards, lately we’ve been heading to the grocery store bulk section and experimenting with different grains in the kitchen. From wheat berries to pearled farro to barley, our weekly salads and bowls have become exponentially more interesting. Just like when I fall in love with a song, when I fall in love with a new dish I tend to play it out until I get sick of it and need a break. However, this Apple Fig Barley Bowl has been on repeat in our house and in our lunch boxes for nearly three weeks now. I’m happy to say I’m nowhere near ready to move on. 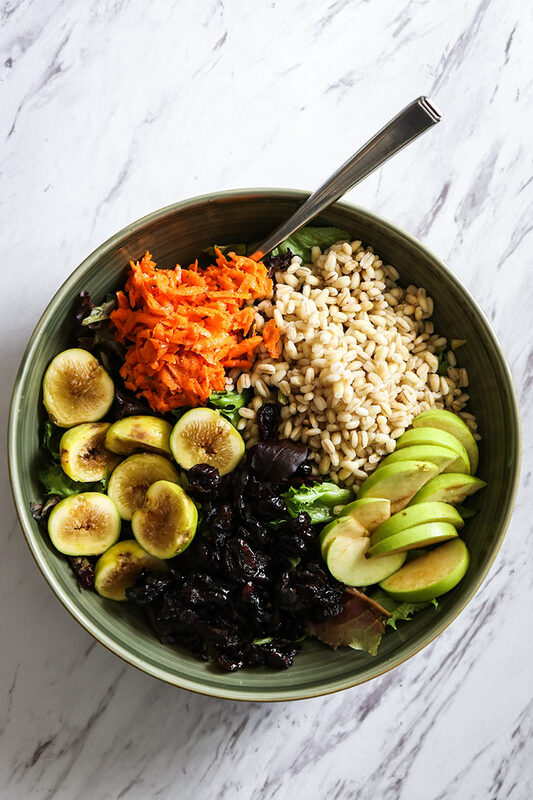 There’s just something about the tartness of green apples, the sweetness of figs, tang of dried cranberries, and chewiness of barley that lends the perfect crunch to an autumn salad bowl. And don’t forget the light and crunch taste of my favorite Honey Citrus Carrot Salad as a topping. Yes, this dish can stick around for awhile. Ok, sure, the salad is delicious. But what’s this about Cashew “Crema”? The Cashew “Crema” dressing for this recipe deserves a recipe post of its own (watch this space in the future, I promise!) for how ridiculously easy it is to make and how “cream-like” it tastes, while being entirely plant-based. Because of the crunchy complexity of this salad I was craving a dressing that was on par with its hearty ingredients – no olive oil and balsamic drizzles for this salad bowl! I scoured the internet and looked at many cashew dressing recipes that included raw nuts and overnight soaking (no thanks), and ended up tested differing combinations before landing on this foundational recipe that takes only five minutes to make. This Apple Fig Barley Bowl is super easy to make on its own, but if you’re in the market for a few new ingredients or kitchen tools to make your life a bit easier, read on for my sustainable kitchen recommendations. Want a handy tool for making the perfect homemade dressing? Thiscertified refurbished Magic Bullet is not only reused (sustainable kitchen hack!) but also cheaper than its brand-new counterpart. And I’ll let you in on a secret: I make all of my homemade dressings and smoothies in a small bullet. The fresh flavor of good quality olive oil cannot be understated. Look, I get it. Good, quality oils can be pricey and I’m the first one to say that an everyday (cheaper!) olive oil can make do on most dishes. But when the olive oil plays a central role in providing flavor, like it does in this dressing, then I go for the good stuff. Can’t find barley in your store’s bulk section? No worries! ThisBob’s Red Mill barley is one of my favorites (or try this pack of 2 for only $2 more). Arrange all salad ingredients in bowl and top with Cashew “Crema” Dressing. Add cashews, water and oil to blender and mix until smooth. Add more water if necessary to desired consistency. Add lemon juice, lemon zest, sweetener and a pinch of salt. Blend and taste, adding more lemon or sweetener until desired taste. Add to salad and enjoy! 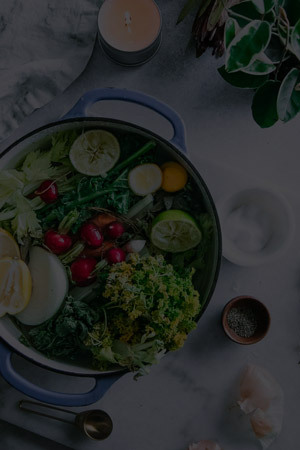 Leftovers & Storage: Salad with keep well in the refrigerator for 3-4 days, however adding mixed greens to other ingredients right before eating will keep them from wilting. Cashew dressing will be good for up to five days, possibly more. Cashew dressing started to thicken when refrigerated, if it’s too thick then add a bit more water or oil and either stir or blend before serving. 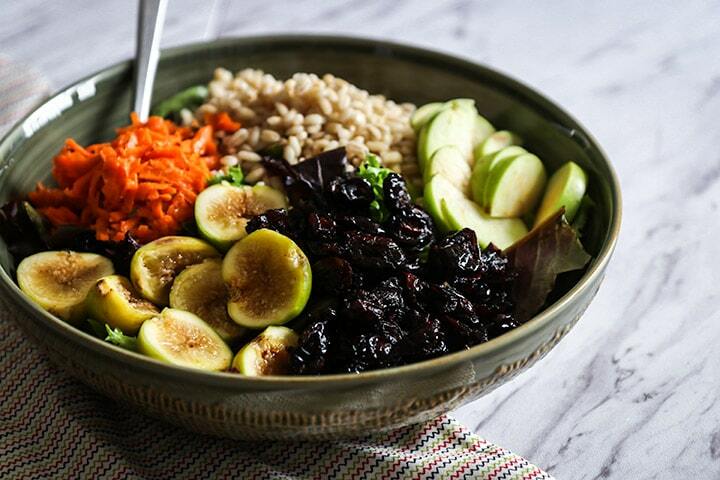 Love this Apple Fig Barley Bowl? 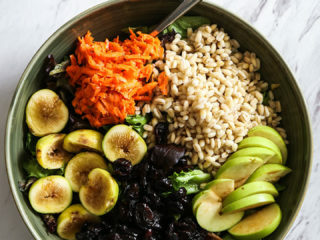 If you’re loving this Apple Fig Barley Bowl, welcome the cooler weather with one of my favorite fall and winter dishes.